We are currently experiencing our longest hot spell since 2006 and the MET Office has recently issued a level 3 heatwave warning, which I think means they are calling in The Avengers to deal with the problem. Which is pointless, as we really need Iceman from the X-Men, unless Tony and Bruce are putting their heads together to create a way to air condition an entire nation. I know people get lambasted for complaining all the time, oh it’s too cold or oh it’s too hot. But I am not freaking Goldilocks and I don’t ever expect it to be just right, so I would much prefer it too cold (it is easier to heat up and you can sleep at night). People tell me to appreciate the sun while it’s here, and I did, for two days and then it just became an intolerable bore. I do appreciate the Sun, it provides the energy for all life on Earth, but during the summer our relationship gets a bit clingy and I feel like telling the Sun I need some more space. A few million miles more space. I think we need to go on a break, it’s not you, it’s me. I am sweating my nadgers off, you keep me up all night (not in a good way) and I can’t take it any longer. 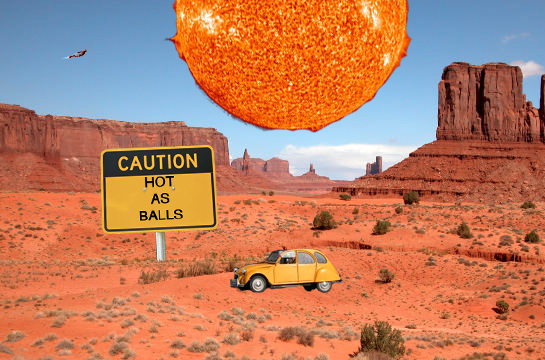 The summer sun makes my car a furnace, my work a sauna and my bedroom an active volcano. The floor is lava. But hey, people keep on telling me to enjoy the sun while it lasts, because it won’t be long before the rain starts to fall and we all drown in complaints of a different kind of rubbish weather. So I have come up with a list of fun things to do in our glorious heatwave. Take an ice bath. This is an experience that would sound absolutely mental at any other time of the year and possibly a method of torture. So this is your opportunity to try this foreign delight. I’m sure it will be exhilarating, refreshing and you will only lose minor extremities. Invest in air conditioning stocks. Now is the time to make money from people desperate for relief. Ask others why they enjoy the hot weather. Step by step tell them why they are wrong. Freezer pants. You know how wonderful radiator pants are when it gets cold? Well freezer pants is your summer equivalent. Sign up for an arctic expedition. You’ll have vodka to keep you warm. Have a barbecue. This may not sound ironic at first glance, but what could be more ironic than gathering around a fire in conditions similar to the surface of the sun. Travel on public transport. It’s a great way of meeting new people. What chance do they have in such close proximity? You will make so many new friends. I would recommend starting with the man who talks to himself and licks his lips all the time or the cat lady. Ask strangers on the high street to rub sun tan lotion on your back and inner thighs. Record their reactions and you have a YouTube classic on your hands. Get nostalgic about ice. This one is self-explanatory. Patent freezer pants. This is your pathway to financial glory. Richard Branson and Alan Sugar started out with similar stories.